I’m guessing this photo was taken around 1964, give or take. 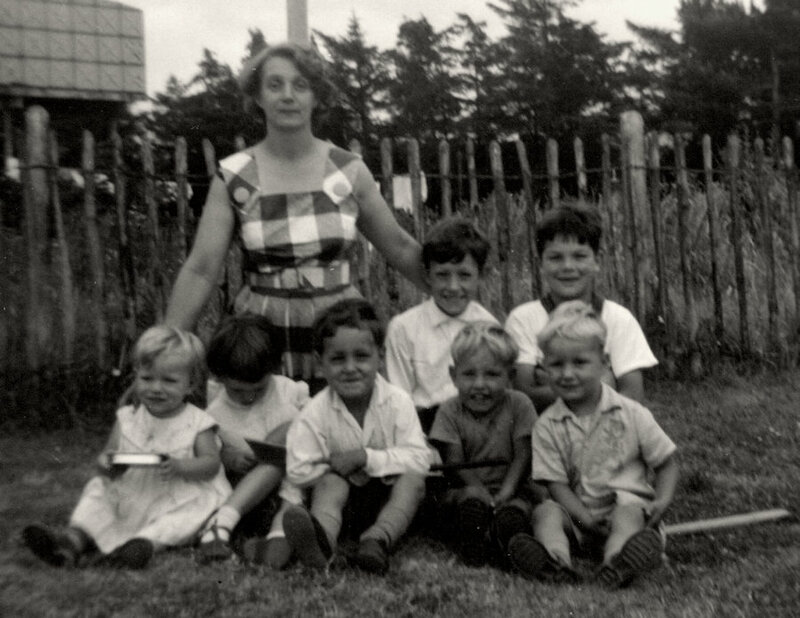 The woman in the photo is my mother, Jean Jacobs, born Jennie Maddison, and among the seven children pictured (two of which are not hers) are the five she had with my father: me, my three brothers, and — arriving last like a bold, italic exclamation mark — my sister. My mother was born in Leeds on Boxing Day 1921, a middle child sandwiched between an older brother and younger sister, fiercely proud of her Yorkshire roots. She had two families, nine children in all: five girls and four boys. When my father died in 1969 she was left with five of us to raise, aged from six to thirteen. It was hard work, and she worked hard. Parents can sometimes seem like strange people when we’re young, doing the oddest things for what seem the dumbest reasons. As we ourselves grow old and become parents and raise our own children, I think we make more sense of our parents and come to understand them better. When I was ten she told me the most important thing she could ever do for me was to make sure I received a good education, and she delivered. Most of us experience losing our parents at some point in our lives, and I think losing your mother is for many perhaps one the toughest things life will throw at us. Today, January 28th, is exactly 25 years since my mother passed away, and it’s comforting for me that I was able to be with her at the end in the hospice, holding her hand as she left this world. It’s hard to believe that so much time has passed already, it truly seems like yesterday. For those who have lost a parent more recently, I have good news: time really does heal the pain, and the love never fades. For those yet to lose a parent, you know they won’t be here forever. If you love them, now is a good time to tell them. But if for some reason you don’t get to tell them, don’t worry. They already know. When I was a kid I used to buy something called a Jamboree Bag with my pocket money. They cost just a few pence, old money, pre-decimalisation. You knew you’d always get a bunch of sweets and a cheap tacky toy, but you never knew exactly what, and that was part of the attraction. Whatever the contents, though, it never put you off buying another one the following week. Celebrity Big Brother is a bit like a Jamboree Bag. You know you’ll get a bunch of (so-called) celebrities, including some (perhaps many) that you’ve never heard of, but you never know quite what you’ll get. No matter what the mix, though, it never puts you off watching the next series. The bunch that Channel 5 have pulled together for the latest series must be the worst bunch of maladjusted individuals ever to grace the house. Few of them seem able to go more than 24 hours without running to the diary room and wailing that they want to go home, and these people are paid extremely well just for turning up. None of them, surely, will come out of the process looking good. None of them come across as being close to normal. Maybe it’s time Celebrity Big Brother went the way of the Jamboree Bag. I start a new contract tomorrow, another six-month contract as a Scrum Master. In a way, contracts are like Jamboree Bags, too: you know vaguely what to expect, but you never know exactly what you’re going to get. Like opening a Jamboree Bag, like a Celebrity Big Brother launch episode, it’s quite exciting.